Nobody watches their wedding video, right?! …or do they?! Recently I have been getting quite a few of these DVD transfer requests, with the latest email from Darren and Dawn to land in my inbox this week: “15 years ago you very kindly filmed our wedding…not sure you will remember…We have two daughters, 12 and 7, and want to show them our wedding video.” Yes, I do remember, not least for the fact that GMTV had chosen to feature Dawn as their ‘June Bride’ that year and to say I had to compete with their camera crews would be an understatement. Who could forget the sight of the TV cameraman literally hanging over the vicar’s shoulder during the vows and ring exchange, complete with boom mic, some industrial strength broadcast light, dougal hovering fetchingly between them and sound man right by his side. So yes, I remember. Which made me think – I have heard this so many times now: ‘We want to show our children our wedding video.’ What a wonderful thing to be able to do – I would really love to have seen my parents’ wedding film or video and hear them say their vows but have to make do with the one silent photo I have. And, even if I say so myself, how gorgeous does my mother look?! And even though, sadly, their marriage didn’t last I love this image all the more, as there was one time when my parents did love each other and this is the proof. I will never hear my father’s voice again – he died seven years ago and the photo doesn’t speak. My mother did go on to become one of the early pioneer adopters of a super 8 cine camera and the earliest footage of myself is me reciting a Christmas poem at the age of about three! The old Kodak currently happily resides in my loft and may yet see the light of day again sometime…watch this space! You would be forgiven if you have fallen prey to the old misconception that wedding videos do not get watched…but I have lost count of the number of emails I’ve had from my couples of ten years or more ago, telling me how they still watch their film regularly or how their children love watching it. Only thing is, they have a hard time explaining to their small children why they are not in it! 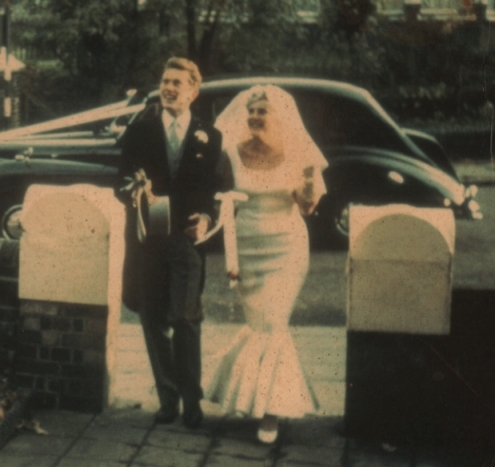 Just ask yourself – if you had the chance to see a film of your grandparents getting married, would you want to watch it? 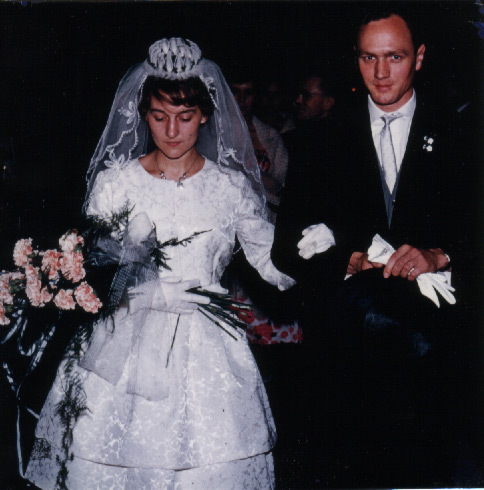 And here, just because we can!, is a picture of my husband’s parents on their wedding day. Yes, it’s wonderful to have, not least because their marriage also did not stand the test of time, but would I love to see a video of any of our parents’ weddings if I could? You bet I would! “We just wanted to say a huge thank-you for our wedding DVD we are totally overwhelmed with it, the most beautifully edited DVD I have ever seen with memories that will be cherished forever. You have exceeded our expectations & beyond, our DVD is a masterpiece which has brought so much happiness to us both and all our family. We all had a good old cry whilst watching it and I can’t wait to show Laila her mummy & daddy getting married when she is a little older.